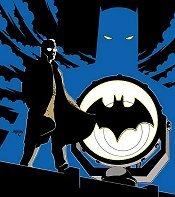 Cover: Gordon, the Bat-signal, and a sillouette of Batman in the background. Story: Gordon investigates the bombing that occured at the end of last issue. Meanwhile, we get to see Bruce Wayne! The ending is great. I can't give away too much without revealing the story too much, sorry. Art: While we have the same colors this issue as last, Batman has shifted over to being orange, which doesn't look as good. The coloring also makes it hard to distinguish Lucius Fox from others. Also, Hester's version of Bruce just doesn't look right. The rest of his art is interesting, but he's not the one I would want to see on every issue. Overall: Urban Renewal was a great story, with excellent cliffhangers and pacing. However, the coloring in the conclusion set it back a bit. Dissapointing, uneventful issue with a predictable conclusion. I liked the whole OG v DeeZee theme but it didn't really come to a head in this issue. I enjoyed the 'Mindy's on the line' scene a lot but the climax was flat. Batman's crash through the window was a contrived action sequence which I felt was totally unnecessary not to mention a waste of Bats time, no one was in physical danger. I would have been much happier if he left the bust to the GCPD. The artwork was not to my liking, everyone had the same prominent cheek bone structure, I look forward to Martinbourgh's return.